The TMNT are practicing their Ninja skills blinfolded in the woods. Donatello is having a particularly hard time concentrating, and the lads argue with him over ruining the exercise. Don apologizes and everyone sets off once again, trying to focus their minds on their other senses. Soon Don stumbles headlong into a wall – that turns out to be a gigantic castle. The Turtles decide to investigate and find a huge corridor full of countless locked doors. Raph finds one that’s off its hinges and kicks the obstacle in. The TMNT find the lifeless body of an ancient warrior lying on a sarcophagus. As the Turtles ponder what’s going on, Don spots someone walk by. The boys hurry out and find an elfish boy scurrying off. The elf tells them “You’re early!” and quickly distances himself from them once again. The Turtles soon track down the boy once again. The foppish faery named Locke explains to them that they’ve arrived at the Halls of Lost Legends – a place where the legends, myths and gods of old go when humanity stops believing in them. After Locke tells his tale, he admonsihes the Turtles to leave this place and once again disappears. This time the TMNT can’t find the lad, and so they begin to explore on their own. Donatello discovers the immobile bodies of the Norse gods… and though lifeless they appear to be, the curious terrapin notes that the form of Odin is shedding tears. Meanwhile, Raph, Leo and Mike have met Cronus – who is definitely not immobile! The huge mountain of a man attacks our heroes and a deadly fight breaks out. Cronus begins shooting fire from his eyes and the Ninjas know they’re in very hot water. Donatello shows up and blinds Cronus, and the Turtles make their escape. Donatello has become suspicious of Locke and determines that the boy was trying to lead them away from where they had originally started. 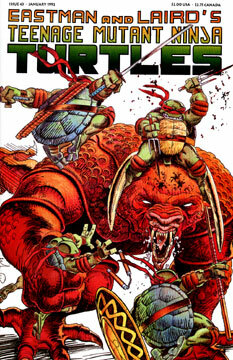 The TMNT retrace their footsteps and find a grand hallway, where Locke happens to be as well. Donatello confronts the elf and announces his deduction – Locke is none other than Loki, the evil Norse god! Loki reveals his true form and quickly summons creatures of legend to battle the Turtles: Fideal, Cerberus, Grendel and Mantichora. A long battle breaks out, but eventually Loki’s minions begin to evaporate into thin air. Loki attempts to summon even worse monsters, but Donatello throws his bo and knocks the trickster god senseless. Don deciphers that Loki himself has captured the men, women and monsters of myth and is ciphoning their power from them to maintain his own. The Turtles hold the foul god down and Leo demands that Loki free those he’s caged. Loki shapeshifts into Master Splinter and tells the Turtles that they’ve passed their test, but the guys aren’t fooled by the ruse and make one final threat. At last, Loki frees his prisoners and all creatures return to their former, living selves. The Turtles are then transported back to the woods where they meet Master Splinter, who bids them to sit around the campfire and tell him of their adventure. Donatello tells the Sensei that it was puzzling that from the time they’d arrived at the Hall of Lost Legends they’d been told that they were early. Splinter isn’t surprised and states that, in time, the Turtles themselves will join the others in the Hall.